A disgusting way to start your day! William J. Beamish Journal #7 - We did it! We won the frog jumping competition! We had to cheat, but how else could we beat an impossibly fit German frog? But in the ensuing excitement, Horny got away and has been captured by Leona’s security guards. He’ll be frog legs very soon, unless I can escape from this security guard. 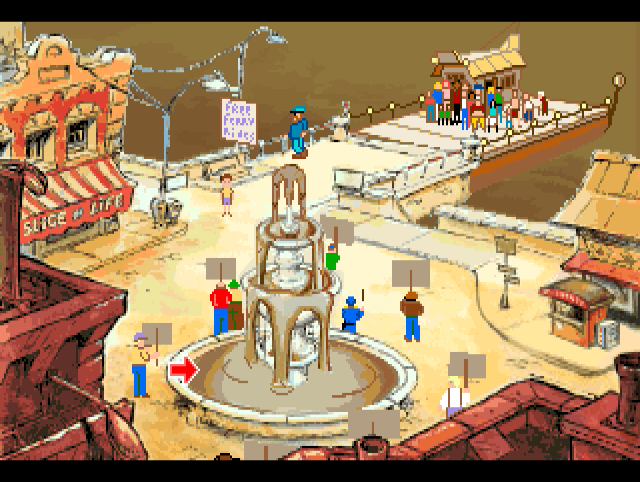 When we last left our hero, Willy had been saved from certain doom at the hands of a singing street gang by a group of Japanese tourist ninjas. This was following an evening where he fought off a vampire bat using a vacuum cleaner. 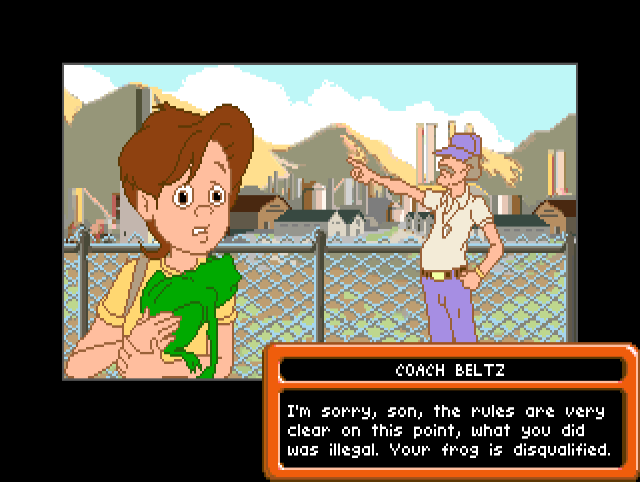 When I started this game, I thought it would be domestic comedy, but it has certainly taken a turn for the surreal! 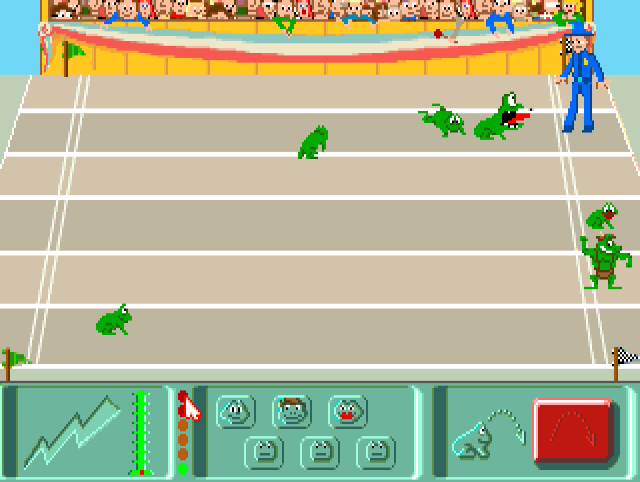 After surviving all of those adventures, we are finally at the big day: the frog jumping competition! And actually, as I think about it, wasn’t the Nintari championship implied to be the focus of the game? It certainly feels like we’re getting close to the end, but I don’t think Nintari has even been mentioned since the first day. Today starts very poorly: Willy wakes up to find that all the water in his house has turned to brown sludge. He can’t brush his teeth. He gets downstairs to discover that Dad is an unshaven mess, unable to find any of his nice clothes and oblivious to all the other chaos going on around him. Mom is mostly freaking out over Tiffany’s new punk rock look, and the fact that Gordon just isn’t noticing that the whole place is falling apart. We also get a brief cutscene to Leona’s office as she muses on how she will soon control the city. People are made to be used, she says, but I’m not sure how young Mr. Beamish will save the day. Will he fix the problems of the town by accident while he wins the contest? Where is this story going? We have to do the morning stuff again like feeding and walking the dog. Just for kicks, I tried to see what would happen if you forgot and the Trouble Meter goes up. I bet you forgot all about the Trouble Meter! I certainly did. We really did leave all the family drama behind days ago, but I suppose Tiffany’s story isn’t quite over yet. I restored back and did my chores because you never know when you might need some extra wiggle room with Mom and Dad. Before Willy can go on his way, we get one more bit of story: his whole front yard is filled to the brim with reporters. Even Stan Lather is there, the one from the news story a few days ago. They are all there to see his dad and get an update on how the plumbing problems affecting the city are affecting Tootsweet. Gordon is an utter mess, unkempt and unprepared for questions before he even made it in to work on the first day. We find out moments later from Leona that he was hired just for this purpose, to be the fall-guy for the company. I’m not clear how this plot would work-- who would blame someone who didn’t even start until the problem was well underway?-- but I suspect we’ll know more soon. Not Dad’s best moment, I’m afraid. Just as the previous days, I’m actually exploring as I go, checking back out each and every room looking for things that changed. This would be very boring to narrate, but I do find a few small things. The fountain in the park is now filled with the same brown sludge as we have at home. Dana is also alone at the treehouse, but all she does is warn me that I’d better hurry to get to the competition. Nothing else stands out. But the thing is… I have figured this out! We already proved that Horny could use the Slam Dunk Cola to give him a super-charged boost. Even so, I get this message each and every time. Is it a bug? Is it a fair warning that I’m not doing what I should? I honestly have no idea. I guess I’ll be finding out very soon. When I get to the town center, I find that the bay has been completely filled with the same brown sludge we see everywhere else. It’s gross, actually. Protesters still surround the fountain, but this time Tiffany is nowhere to be found. The pizza place remains closed and the shirt vendor doesn’t have anything new to say, so I think the ferry is the only place to go. There’s a sign advertising free rides, so at least this time I won’t have to fish another token out of the fountain! Like a chocolate fountain, but infinitely more disgusting. 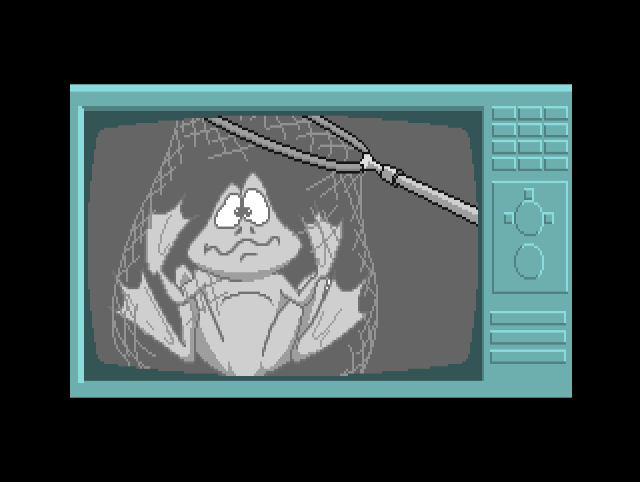 Once on the ferry, I get yet another cutscene where Turbofrog and his owner, Hans, are being interviewed by Stan Lather for the local news. 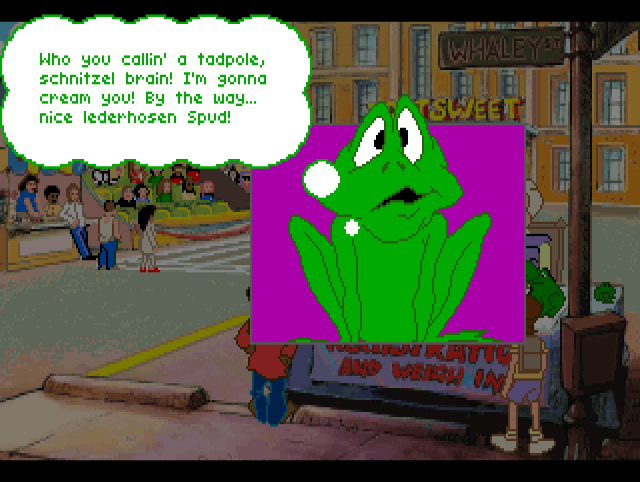 Hans talks smack about his competition, while Turbofrog just looks like a frog wearing lederhosen. Hans says that the reasons his opponents will lose is because they don’t eat enough; is this grandmotherly advice? or a hint of some kind? In all of this, Willy just stands around looking disgruntled. I had initially thought that Dana wasn’t there, but she and Gigi are off to the left, partially blocked by Stan. Is that Martha Stewart in the background? The first time I watched this, I thought for sure that Han’s name was “Hans Hans”. That would have been funny! This is less funny, but at least sets the stage. When we arrive at the docks, all of the passengers disembark and head toward the Tootsweet building. I head to the Sludgeworks instead, but it’s pretty clear that the designers didn’t really intend for you to do any exploring here. Willy and the protesters have the same dialog as the previous day, including Willy asking for help getting home. It’s disappointing for a game that has otherwise been pretty detail-oriented, but perhaps it can’t be helped. I head straight to the Tootsweet building instead. The area looks a lot busier than yesterday: while the registration booth is gone, now the stands are filled and a group of contestants and judges are waiting at the registration table. I hand over my registration blank-- thankfully Willy already filled it in since I wasn’t able to figure out how yesterday-- and everything seems to be in order. We get some quick dialog between the frogs as Gigi gets the hots for Turbofrog and Horny gets jealous. Once again, I’m not sure whether the implication is that Willy understands the animals or if this is just for our benefit. Before I continue, I want to point out some strangeness in the art. If you compare the cutscene on the ferry with the scene at Tootsweet, there are some strange differences. The woman I had identified as Martha Stewart? She seems to have lost her vest and grown a beard. Or is that supposed to be someone else? We will shortly find out that there are six frogs in the contest, so it could still be someone else… but just barely. The other thing that sticks out at me is that Turbofrog looks to be two completely different sizes in these pictures. On the ferry, he is huge, many times larger than any of the other frogs. But here, he’s bigger but not so much bigger. Probably just artistic license, but it bugs me. As the race gets underway, we discover that it is officiated by faculty from Willy’s school! I’m positive that I said they would return back on the first day, so at least I got one of my predictions right. Willy’s principal, with hairpiece intact, seems to be the master of ceremonies, while Coach Beltz is the referee. I hope neither of them hold a grudge. Leona gives a brief speech where she talks about how she wants to give back to the community, but her worse nature is quickly revealed as she reveals that this is all being done for the launch of new Diet Slam Dunk Cola. Evil capitalists in adventure games… what will they think of next? The race itself is played out in a separate screen. It looks like a minigame, but it really isn’t as there is only one button and no obvious strategy. When you push the red button, Horny jumps forward a tiny bit. Meanwhile, Turbofrog lives up to his names and kicks everyone’s asses. We didn’t stand a snowball’s chance. That’s Horny on the far left, sucking at this game. When you lose the race, you lose the game. Willy and his family find themselves destitute and living in a shack. The end. I didn’t expect to win as we didn’t even pull out our secret weapon yet: Slam Dunk Cola. I restore and start the race again. This time, Horny looks pumped! When the race starts, he jumps incredibly high and far and easily wins the race. No one else even stood a chance. Gigi comes over for a kiss and Horny does a little victory dance in the end zone. I suspect you know the one. The whole scene is very cute, but before I can celebrate the judges come over. They suspect Horny of doping and want to have him tested. When they discover the cola, they disqualify him for doping. I lose again. The end. This is not at all what I expected. This is very bad. It seems that all of those warnings that I had been receiving were real and I was a big idiot for just skipping them. And yet, I have absolutely no clue what I missed or what I could have done differently. I do like the anti-drug message here and cheating is never okay, but it leaves me in a bind. Should I restore all the way back to the second day? Rather than restore back, I am going to try to play through for now. I may still be stuck, but I’m not convinced that Dynamix has gone the full “Sierra” yet with their games. Would they have a dead end like this so far in the game? I really hope not. Some amount of trial and error later, I find something that just may do the trick. Way back on the second day, I discovered that if I fed Horny the flies that he would get sleepy. What if I do the same to Turbofrog? Seems easy enough. And when I do it, I know I’m on the right track: I get caught and disqualified for cheating, but the game also tells me that I just need to be more subtle! This is some great positive reinforcement because afters several attempts, I am able to get Turbofrog to eat the flies. I think that the trick involves doing it while the judge is looking away, but honestly I have no idea. I’m just glad it worked, even if it cost me another four deaths. One strange thing is that when I played this “for real”, Gigi actually won but disqualified herself to kiss Horny. But when I tried again with the capture tool on, Horny won fair and square. I have no idea the difference, but that’s the version that you see above. After I win and Horny does his dance, all of the frogs go a bit crazy and start hopping all over the place. Before I can catch him, Horny hops into the Tootsweet building, past a guard desk, and up an elevator. With nothing else to do, Willy chases after him. Passing Leona’s office, Willy happens to catch a conversation between her and his father. She utterly eviscerates him, but you can tell that he’s trying to do all the right things. He wants Tootsweet to help mediate for the plumbers’ union, for example, which seems pretty noble. She doesn’t like it one bit. I’m glad that Gordon is getting some positive vibes here. Will he be the one to save the day in the end? Before I can hear any more, Willy gets captured by a security guard. The guard takes Willy down to a security room where we are given one final and terrible surprise: Leona plans to eat all of the contestants! She just loves frog legs! With a guard looking over his shoulder, Willy looks on helplessly on a security monitor as Horny is found and captured. He’ll be heading to Leona’s frog leg feast soon enough. How are we going to get out of this one? With that, I think I’m going to end our adventure for this week. With Horny heading to the mansion, I suspect that will be Willy’s next stop… as soon as he escapes from the guard. Or am I forgetting a whole Nintari Championship sequence? This has been a fun ride so far and I’d hate for the game to overstay its welcome. Instead of predictions, let’s try something else. What will happen with Tiffany and Cliff? Will she shed her punk-rock image and what impact, if anything, will that have on the plot? Will Perry’s baseball card come back into the picture? That ship seems to have sailed, but I hope I didn’t miss a puzzle. I haven’t visited the Union Office or Sludgeworks Factory yet, both blocked off the previous day. Will Dad get to try to end the strike and play hero? What about that lottery ticket? I won the prize money, so why will I need that now? I also have a whole mess of items that I haven’t found a use for yet including the dog tag chain, and the yo-yo, both of which I have been carrying since the beginning. Once again, the humor seems much better in this section so there are no “terrible” jokes, as such. The worst of the lot is the extended breakfast scene where everything is going wrong and all Dad knows is that he’s running late and he can’t find the clothes he wants to wear… that is, until he notices Tiffany’s new look. I also like that Gordon spends the whole section looking disheveled and unshaven; the lack of water really is taking a toll on everyone. Before I go, I have to admit that I have a lot of animated GIFs this time around. Let me know what you think. Do you like these? Or would you prefer more individual images inline to tell the story? Doing these are a pain as I have to record in one program then edit in Gimp to remove extraneous stuff at the beginning and the end. I’m happy to keep doing the work if there is general agreement, but I also know they make the page much heavier to load. 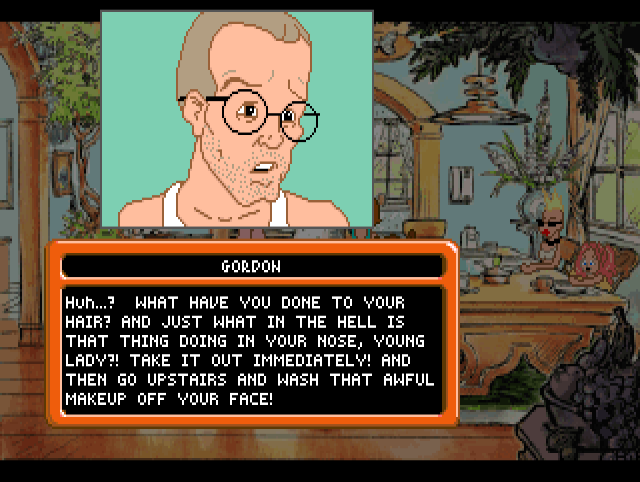 Something I forgot to mention the first time I posted here: There is a great Lucasarts-style adventure that for some reason got terrible reviews--Randal's Monday. Randal's is a really cool tribute to the classics, with great characters, hilarious jokes and really complex puzzles that follow internal logic despite requiring lateral thinking--and most of them can be solved with neough thought. I really recommend it. Ooh. I have a plan. Putting it in Rot13 in case I'm somehow correct. 2. Pna lbh trg fbzr Qvrg Pbyn? 3. Be znxr lbhe bja? 6. Vs gung qbrfa'g jbex, hfr gur pbyn ba jngre gb znxr vg qvrg. If I am correct, I'm claiming I'm a good adventure game player. The evidence of my being stuck multiple times in King's Quest V and solving puzzles accidentally in Martian Memorandum are just anomalies. I like short gifs that loops within 5 secs. Anything more and loading time on mobile becomes horrible. So I also have a stake on the answer to this question. Do we like gifs or dislike them? Perhaps we should put up a poll for this at some point. I think a tasteful, short animated gif adds to the experience (I remember appreciating the ones for Elvira). IMO all the animated gifs for Willy Beamish have been way too long. Just put in a link to someone's LP on YouTube if you want to show "the morning routine." I appreciate the feedback and I am interested in other opinions. For me, I know that I enjoy posts that have a good ratio between pictures and text and from experimentation, I find that I like around 170 words per image or so. Not an exact science by any means, but that looks "nice" to me. Using the animated GIFs when there is a lot of stuff to portray or where there is an interesting scene is in some ways a shorthand, so that I don't have to do image-image-image. Think of the ninja sequence last post, for example. I'm not sure that I could have captured the spirit of one of my favorite scenes so far without showing it animated. 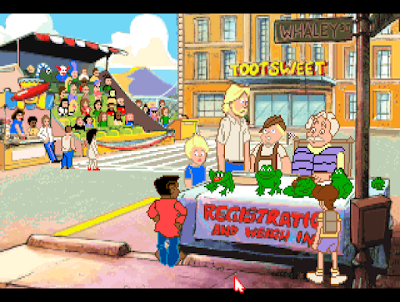 Willy Beamish also is a very animated game. Even just watching Willy stand around and look impatient, it's quite a bit better than almost all of the games of this era. There are custom walk animations in various circumstances. It's hard to capture that. And to Fry's suggestion, I can't link to LPs because I can't watch them until I am done playing myself. I have been very "no spoilers!" this playthrough. I do think this post was a bit GIF heavy because we are approaching (I hope!) "the end". I can dial that back in subsequent posts, even if the consensus is that animated images are okay. Joe: If your emulator just has the means to make video clips, remember that we have our own Youtube account where we can upload stuff and then link it here. This might be a better solution for longer scenes than GIFs. My emulator doesn't even have that. I have to position a window over the window and not move anything around to capture the video. It's quite a bit of work to get the ones that I got, but if they are not well-liked then I can just avoid doing that work. But I do want to figure out a good way to get the flavor of the game across better than still images. I agree that the GIFs have been too long, in general. I think including brief ones is great to show off the animation and stuff, but when it's mostly dialogue, it's not as useful to display whole scenes. I'm not so concerned about the loading times, personally, even though I do read on my phone sometimes, but it's more that they're so long that I usually end up watching them starting in the middle and then have to loop through the beginning again. Shorter pieces would loop quicker and it'd be easier to see the whole thing. This is important when it's a format that automatically loops rather than being started by the user. What a bizarre game! I do like how Dynamix kind of went for broke on this and threw seemingly whatever came into their head (random inspirations? ADD? Drug use?). I just hope, for your sake, that the whole game holds up. Regarding the GIFs, I'm not a fan. I would prefer--and tried to do in my reviews, but failed--of video capture that I can choose to start and stop. Longtime lurker here... I was just going to ask about how the GIFs are created, because I think the're impressive; a great alternative to embedded video. Then I see there is a discussion about them, nice!